Singapore officially the Republic of Singapore, and often referred to as the Lion City or the Little Red Dot, is a sovereign city-state in Southeast Asia, and the world's only island city-state. It lies one degree (137 km) north of the equator, south of the southernmost tip of continental Asia and peninsular Malaysia, with Indonesia's Riau Islands to the south. Singapore's territory consists of a diamond-shaped main island along with 62 other islets. The island rose in importance during the 14th century and became an important port until it was destroyed by Portuguese raiders in 1613. Singapore was founded as a British trading colony in 1819. Under British colonial rule, Singapore grew in importance rapidly becoming a major port city. During World War II, Singapore was occupied by Japan from 1942 to 1945. After the war, Singapore reverted to British control, with increasing levels of self-government being granted. It joined the Malaysian Federation in 1963 but separated two years later and became independent (9 August 1965.). Since independence, extensive land reclamation has increased its total size by 23% (130 km2), and its greening policy has covered the densely populated island with tropical flora, parks and gardens. Singapore subsequently became one of the world's most prosperous countries with strong international trading links (its port is one of the world's busiest in terms of tonnage handled) and with per capita GDP equal to that of the leading nations of Western Europe. The first stamps of independent Singapore country issued on 9 August 1966 to commemorate the first anniversary of independence marked Republic of Singapore but all later stamps to this day have been marked just Singapore. Click on image for a detail description. 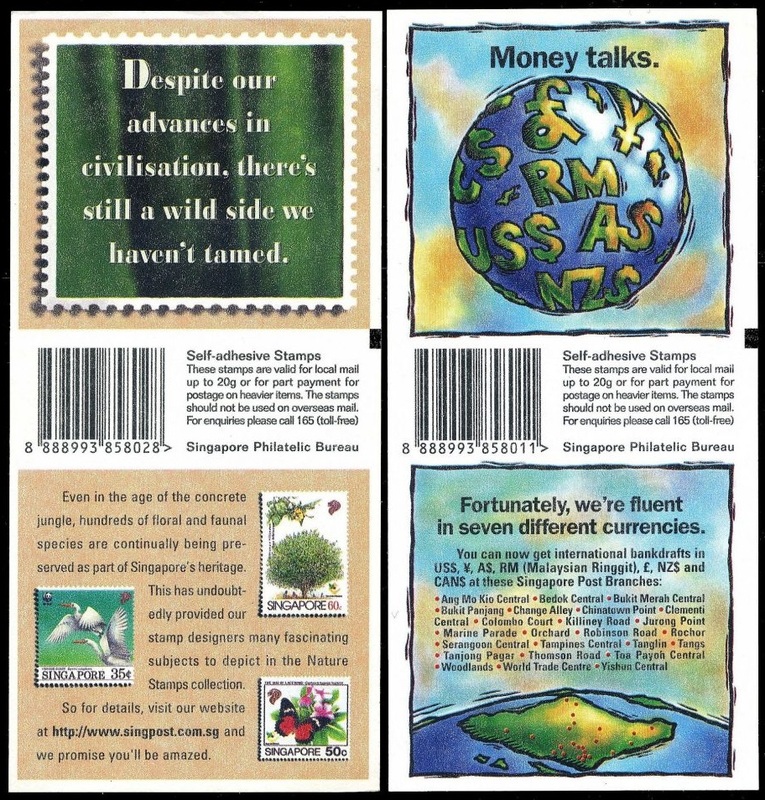 Click on year number to see all Paleontology and Paleoanthropology related stamps issued in the year. This set of self adhesive stamps, with "For the local address only" face value, issued in a sheet of 15 and was sold exclusively via OCBC (Oversea Chinese Banking Corporation) ATMs for limited period of time. Within that period, two different designs of the backside were issued. The sheet designed with exactly the same dimensions(156mmx74mm) as the currency note of SGD 50 and very thin (less than 0.13mm ) so that they can be issued through the same aperture. (New notes with a different dimensions were issued in 1999). 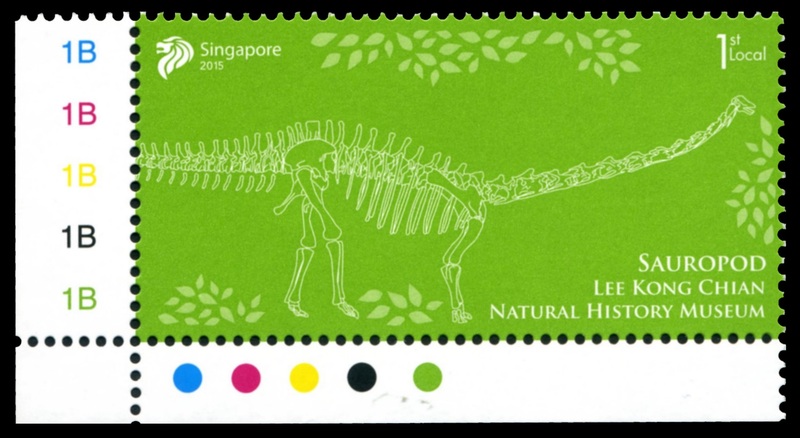 These stamps are very likely the thinest Paleontology related stamps.So far there were only two such ATM issues in Singapore. The other was Palm Tree stamps issued in 1993. They were issued through arrangement by the bank with Singapore Post.